Happy British Pie Week everyone! That’s right, a week devoted entirely to pie and here at Meat Filled Pastries we are fully embracing the festive period with a plethora of pie lined up for your delectation over the coming week. This review is the first of two from the home of Ayr United, Somerset Park one of the few remaining senior grounds in Scotland with a proper old school feel to it. With a main stand that I swear hasn’t been touched since it was built and three sides of proper terracing. The home end, when even half full, can generate a proper atmosphere that only a pitch level terrace can. It will be a sad day when the inevitable move to a one or two-sided, Lego brick special in the middle of an industrial estate somewhere transpires and as such if you’ve never been I highly recommend a visit before that fateful day arrives. 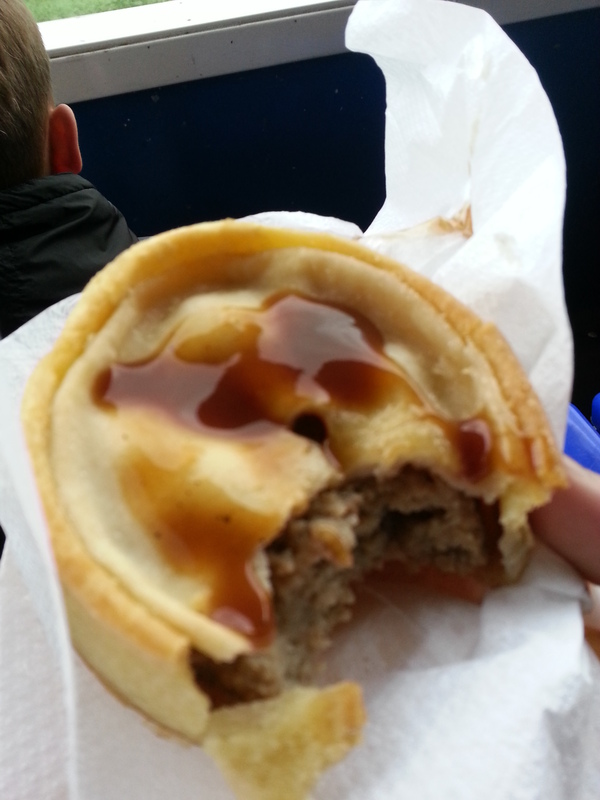 As I say this is the first of two reviews from Ayr and as always in the case of double reviews we start with the humble scotch pie, the number one snack of choice across all of Scottish football. 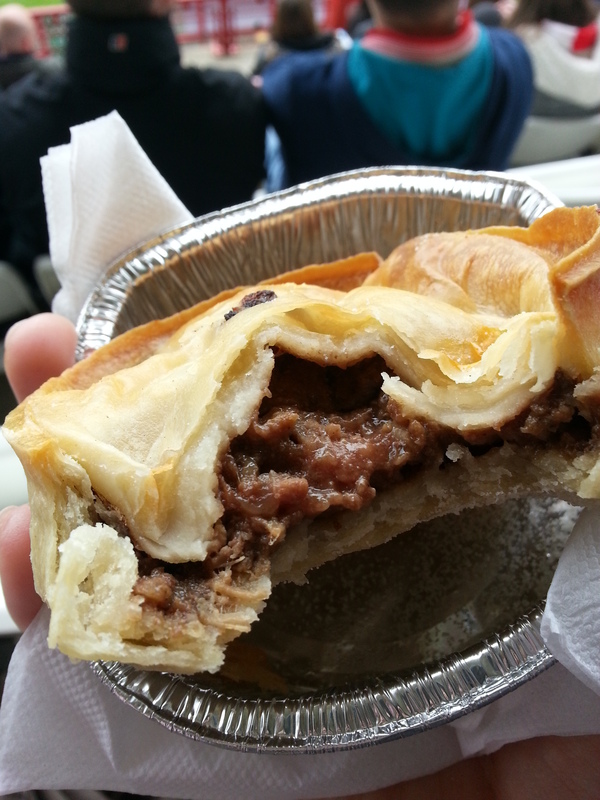 Price: Priced at £1.50 this pie falls snugly into the price range found at grounds across the lower divisions in Scotland’s professional set up. Presentation: After our flowery diversion at Kirkintilloch Rob Roy last time out (Pie 51), it is a return to the medium-sized plain white napkin, that classic pie look that will never go out of fashion. I should note here that this pie was roasting on receipt and as such my napkin was halved in my hand to prevent the potential disaster of a pie lying prone upside down on the floor beside me. 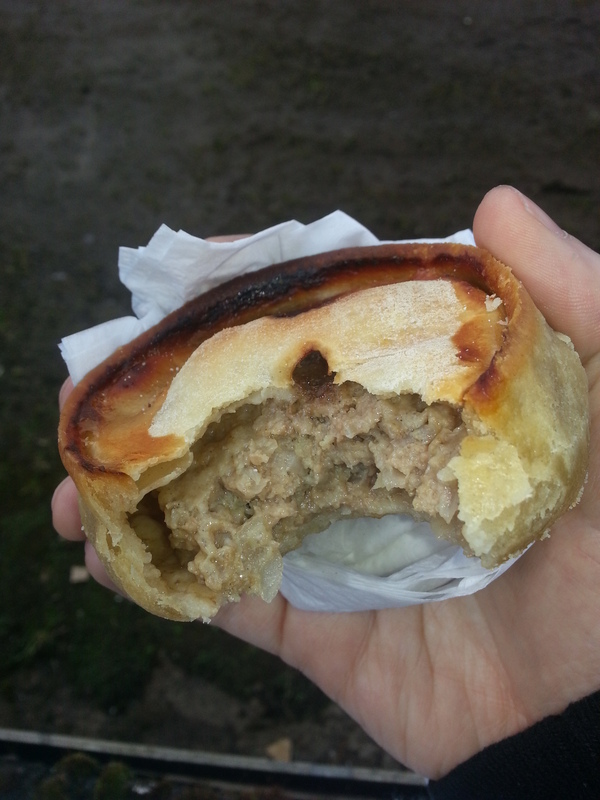 Meatiness: This pie was filled with mutton to near perfection, there was a small gap between meat and pastry to help cool the meaty innards as you ate. The meat held together excellently on first bite and continued to do so as I munched my way through. 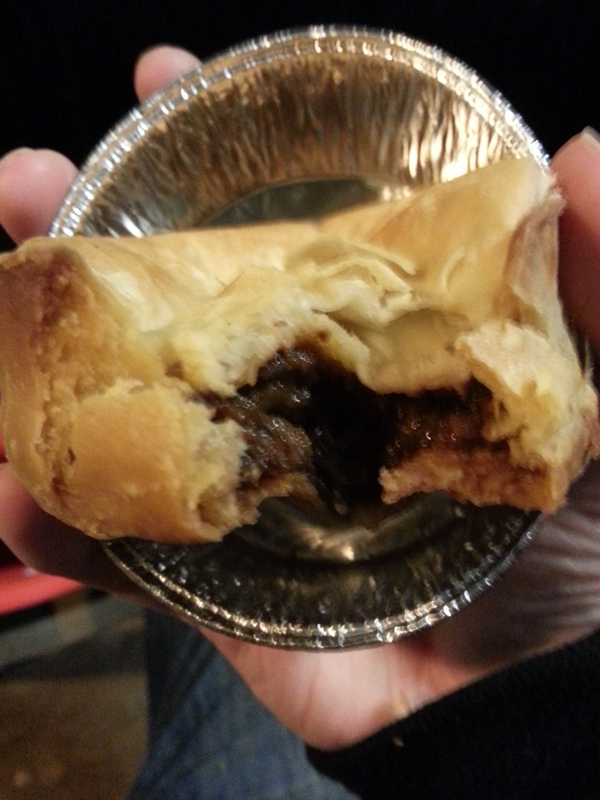 There was a definitive hint of spice in this pie but not through a big kick of pepper as normally would be the case but instead from something much sweeter. If you asked me to pinpoint it to one flavour I would speculate on a hint of smoked paprika but at the time of consumption I found it hard to really nail down exactly what I was tasting. What I can definitely confirm though is that this was a very tasty pie indeed and the flavour lingered all the way until pie number 2 was ready for consumption. 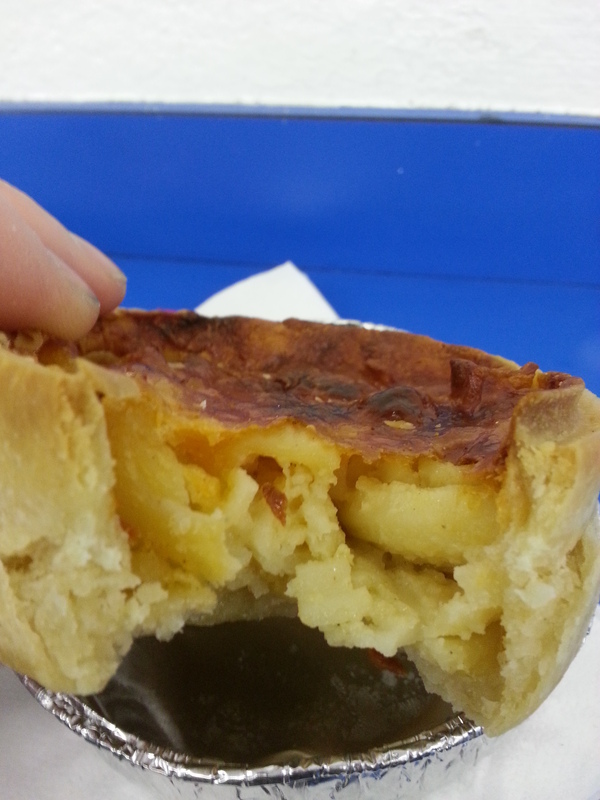 Pastry: The pastry was a lovely and golden in colour that managed to be just crisp enough to added a nice crunch at the top of the crust but soft enough that the pie could be gobbled up in two or three bites if the mood took you. It tore off from the main body of the pie with ease and as such at no point did I fear that a meaty dribble would cascade down my arm and fall heartbreakingly onto the floor below. 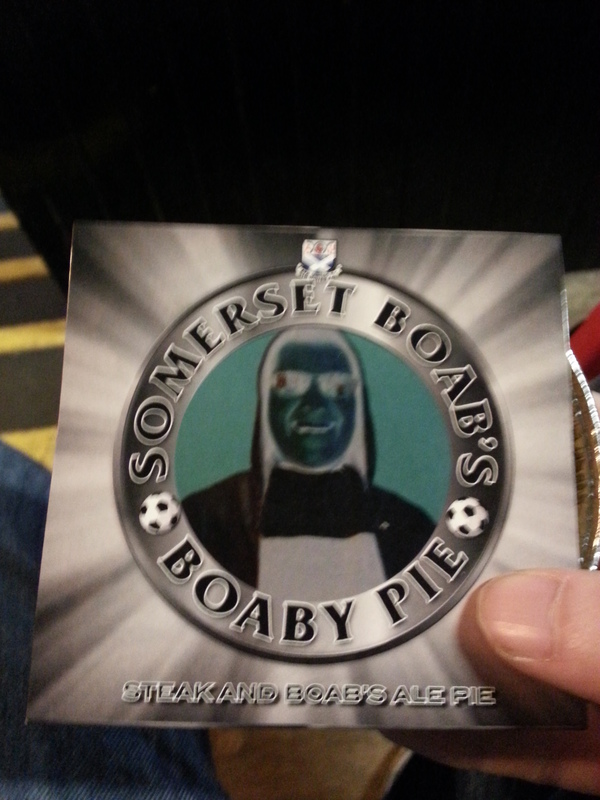 One of the better pastries I have tasted on this journey. 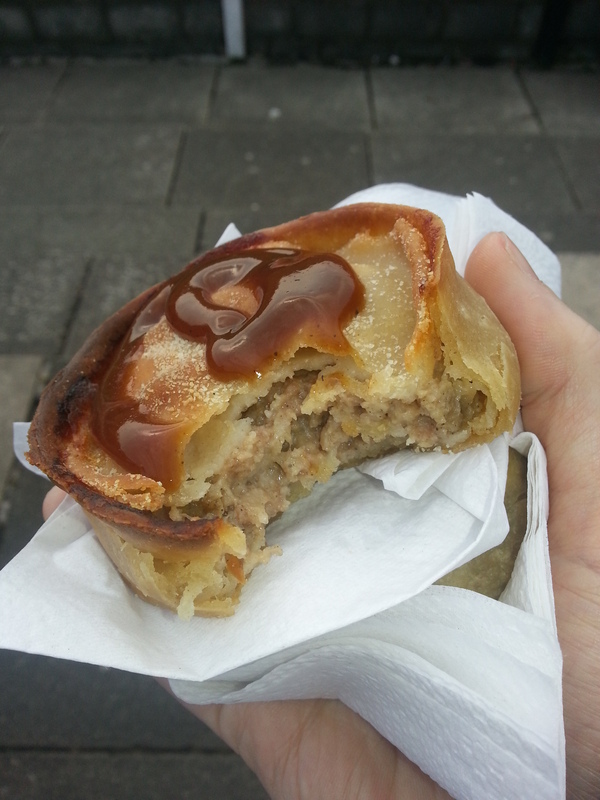 Overall: This was an excellent scotch pie and a cracking way to start British Pie Week, it was a near perfect taste combination of meat and spice with a slight sweetness to be found the further you ate while the all important meat to pastry ratio was pretty much spot on too. Gravy Factor: The kind of gravy that you would stick in a mug and drink while everybody around you pretends to enjoy their cup of tea that was handpicked by a spider monkey. As you should be able to tell I liked this pie, and if it had been the only meat filled delight on offer I would have quite happily had another but I already had my eye on something far more luxurious, A Steak & Ale Pie and if you want to see what I thought of Pie 54 then tune in later in the week as Meat Filled Pastries celebration of pie continues to rumble on. But until then go forth and eat pie! My latest non pie piece ‘Pretty in Pink’ is found not only on Leading The Line but also at www.footballbloggingawards.co.uk looking at some of the pinkest kits you’re eyes ever did see and the stories behind them. I also encourage you to look out for my piece ‘Defining World Class’ on the same site, you’ll have to scroll down a bit but it’s definitely worth a read. 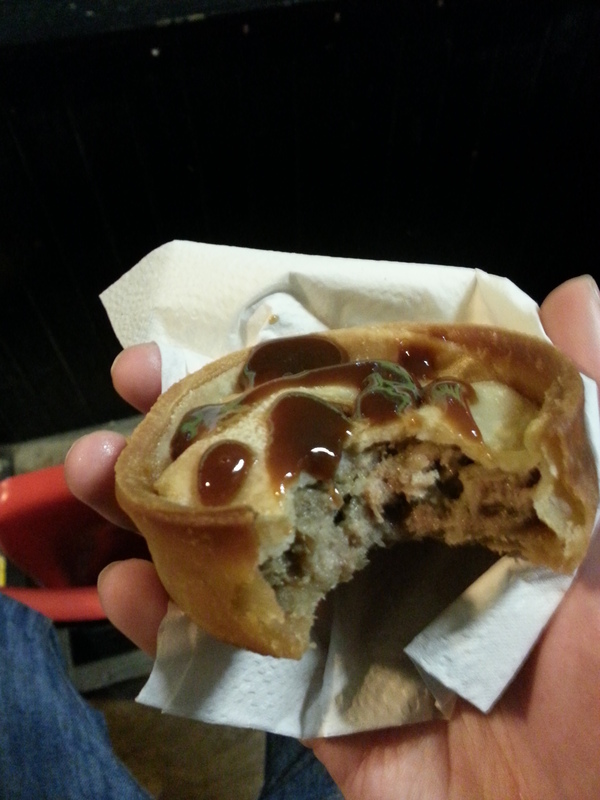 This entry was posted in Football Pies, Professional Pies, Sporting Pies, The Life of Pie and tagged ayr united, brown sauce, Football, football blogging awards, forfar athletic, Gravy, leading the line, league one, Meat, meat filled pastries, mince, Pie, scottish football, somerset park, spfl, spider monkey, spread the gravy.